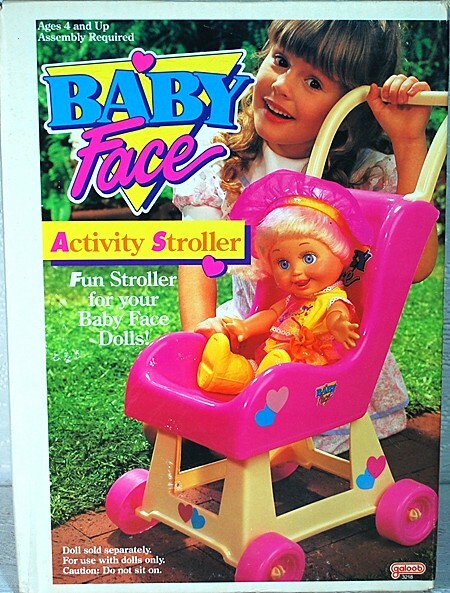 In addition to the dolls, Galoob also made outfits sold seperately, diapers, a stroller and Magic Diaper Babies. Through Kiscom's licensing program several other manufaturers created other Baby Face merchandise. They included sewing patterns. party supplies. childrens footwear, watches, duffel bag, backpack, waist pack, sleeping bag, and small Baby Face PVC figures. Baby Face collector Lynda Gies and her daughter Gwennie pictured with their Baby Face collection. Cynthia is shown getting a ride in the Baby Face stroller. There was also a small and a large plexiglass store display that are prized finds for the avid Baby Face collector. 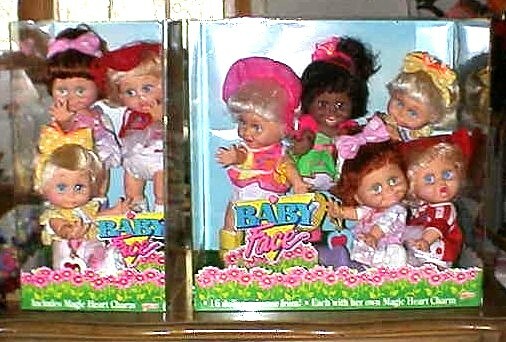 They were not available for sale, but were used to promote sales of the Baby Face dolls in the retail stores. 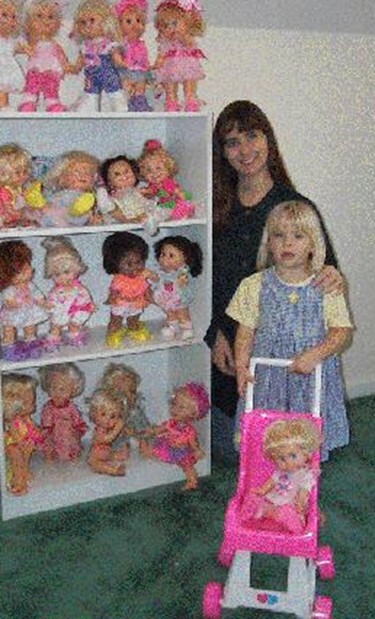 The small display contained three dolls, Suzie, Sarah and Sherri. The large display had five dolls, Suzie, Sherri, Sarah, Dee Dee and black Natalie. Sometimes when the displays are found today there will be different dolls inside, probably due to people opening up the cases and switching out the dolls. Caution: These cases are very difficult to ship without damaging the plexiglass. This is why most cases are found with cracks in the plexi.